Playing a round of golf on OptiShot is just like playing a real round of golf on an actual golf course. In the OptiShot World section we looked at the Course View and the component parts of the screen. The only changes for Game Mode are, in the center of the screen we will display the current player's score, and just below that their Name and number of strokes. After each player completes their shot, OptiShot will display the next player to shoot. In addition to the standard Menu items covered in the How To Use OptiShot section, Game Mode has several new menu items. On the left we see the Shot Info menu, the new items are Mulligan, Drop Ball, and Pick Up Ball. These will be discussed below. On the right we see the Tools menu, the new items are Scorecard and Save Current Round. As each hole is completed, the Scorecard will appear briefly on the screen. 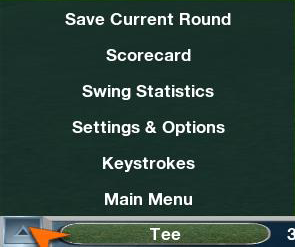 You can view the Scorecard at any time during the game by opening the Tools menu in the lower left and selecting Scorecard or hitting the S key on your keyboard. It displays each player, their score for each hole, their scores for the front 9 and the back 9 and overall score. The scores for each hole are color coded to indicate Par, Bogey, Birdie and Eagle. At the top of the Scorecard is the Game Type currently being played. Next to each player is a color coded box indicating which Tee Box that player is using. 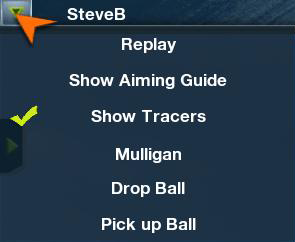 If mulligans were selected during Game Setup they may be taken by opening the Shot Info menu in the upper left and selecting Mulligan or clicking the M key on your keyboard. If you did not choose to allow mulligans the menu item will be disabled and the keystroke will not work. Any player can take any number of mulligans. 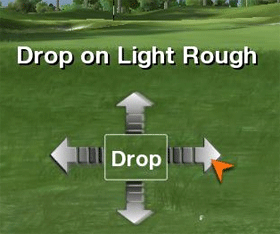 Note: If, during Game Setup, you set OptiShot to automatically complete putts, you will not be able to take a mulligan on a shot that activates these and completes the hole. There may be a time during play where you find yourself in a unplayable position. You can use the Drop Ball feature to move your ball into a playable position. To do this, open the Shot Info menu in the upper left and select Drop Ball. The Drop Ball tool will appear on the screen. To move the ball, click on the four arrows surrounding the Drop Box. OptiShot will move the ball in that direction and indicate the type of terrain at that location. Once you happy with the location, click the word Drop in the center of the Drop Ball tool. Note: Taking a Drop Ball will assess a one-stroke penalty. In some circumstance, OptiShot will determine that your ball is unplayable, will move it to a playable position and assess a 1 stroke penalty. See the Penalties section for details. At any point a player can pick up their ball. Depending on the Game Type you are playing, this will either concede the hole or prompt you to enter the number strokes you would have taken to complete the hole. To activate this feature open the Shot Info menu in the upper left and select Pick Up Ball or click the P key on the keyboard. In Stroke Play and Best Ball you will be asked to enter the number of strokes to complete the hole. In Better Ball, Match Play, Stableford, Skins and Alternate Shot using Pick Up Ball will concede the hole. (In Stableford you will be given a score of 0). 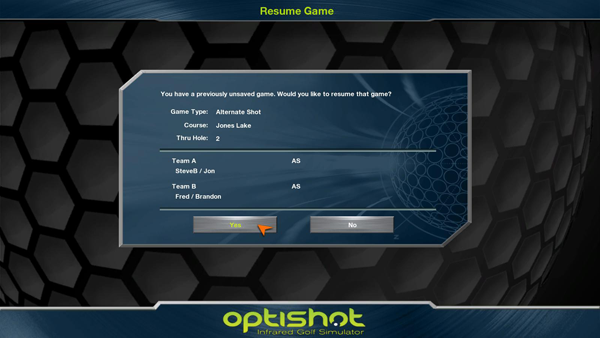 OptiShot allows you to save a partially completed game and resume it at a later date. To Save a game, open the Tools menu in the lower left and click on Save Current Round. The Save Game window will pop up. By default it will name the game for you using the name of the course, the current hole and the date. However, you can change the name if you wish. This game will now appear in the Saved Games list you can access from the Main Menu (see below for instructions on how to resume a Saved Game). If you choose to leave a game by opening the Tools menu in the lower left and clicking Main Menu or by using the Q key on your keyboard, you will be asked if you want to Save the game. If you click Yes you will be taken to the Save Game window above. If you click No the game will not be saved. If you click Cancel you will be returned to the game. If you have already saved the game and then leave you will not receive this message unless you have completed one or more holes after saving. You can save as many partially completed games as you wish. To resume a Saved Game, go to Saved Games in the Main Menu window. This will bring up a list of all your Saved Games. Note that in addition to the name of the Saved Game, OptiShot prepends the Game Type you were playing. Select the game you wish to resume from the list and click Play. You will be taken to the Tee of the next hole with all players and scores intact. Note: If you complete one of more holes in this Saved Game, you need to save it again to include the newly finished holes. If you were partway through a game when you exited but you did not save the game, the next time you start to Play, OptiShot will ask you if you want to Resume this Unsaved Game. You can click Yes and resume that game where you left off. If you click Yes OptiShot will resume this game where it was left. If you click No you will proceed with the regular Game Setup process. Note: The details of this unsaved game will remain until either you play it and save it, or you play another partial game. OptiShot will only keep track of your last partial unsaved game. You may find that you have Saved Games that you either have completed or for some other reason no longer need. You can delete Saved Games by selecting them in the list and clicking the Delete button. If your ball lands in water OptiShot will move you to the nearest ground and a 1 stroke penalty will be assessed. If you hit the ball out of bounds you will be moved back to where you took the shot and a 1 stroke penalty will be assessed. When you use the Drop Ball feature to move out of an unplayable lie, a 1 stroke penalty will be assessed. If OptiShot determines that the ball is unplayable, it will move the ball to a playable position and assess a 1 stroke penalty.